Remove the husks and the silk. 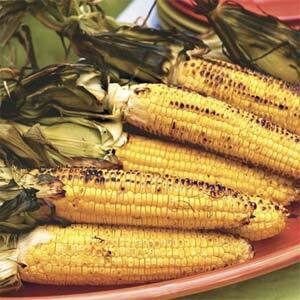 Spread the corn generously with margarine or butter, salt and pepper. Wrap in heavy aluminum foil (double thick). Place over a medium heat on the grill about 6 inches from the heat source. Grill 15-20 minutes, turning often. Carefully fold the husk back and remove all the silk. Cover the ear with margarine or butter, salt and pepper. Fold the husks back in place and tie with heavy string that has been soaked in water. Place over a medium heat on the grill, about 6 inches from the heat source. Cook 20-25 minutes, turning often. Corn is done when no milky juice leaks when kernel is cut or pricked.